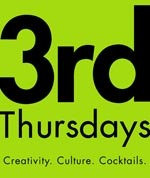 The opening 3rd Thursdays, from 6 to 9 pm, presents Mambo Madness with DJ Steve’s Latin Dance Party (salsa, rumba, cha-cha-cha). Quesadillas are on the menu along with specialty cocktails from VMFA’s expert mixologists. Take a free tour. Learn to dance the salsa. Tickets are $10 (member s $8). Tickets may be ordered online. Tickets may also be purchased at the museum or by phoning 804.340.1405. Free parking in the museum’s deck is included in the ticket price.